Washington, D.C. — Nonresidential construction spending expanded 0.5 percent in August, totaling $691.8 billion on a seasonally adjusted, annualized basis, according to an analysis of data from the U.S. Census Bureau by Associated Builders and Contractors (ABC). Though this represents an improvement from July’s total ($688.2 billion), nonresidential spending remains 3.4 percent below its year-ago level and is down 3.8 percent from the cyclical peak attained in May 2017. 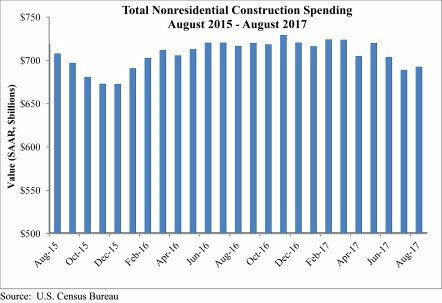 Spending levels expanded in 10 of the 16 nonresidential construction subsectors in August on a monthly basis. The manufacturing subsector experienced the largest absolute monthly decline (-$2.6 billion) and the greatest year-over-year decline (-$16.1 billion). “Though nonresidential construction spending expanded in August, there is a disconnect between spending data and other data characterizing the level of activity, including backlog and employment,” said ABC Chief Economist Anirban Basu. “Collectively, nonresidential construction firms continue to hire, and staffing levels are well ahead of year-ago levels. That is consistent with a busier industry. ABC’s Construction Backlog Indicator (CBI) also continues to show that the average nonresidential construction firm can expect to remain busy, with a significant amount of future work already under contract. But the spending data show that the industry has actually become somewhat less busy over the past year. “There are a number of possible explanations,” said Basu. “One is that employers may be forced in many instances to replace each retiring skilled worker with more than one employee. This is also consistent with declining industry productivity measured in terms of output per hour worked.